Things have been so hectic around here lately that we have not even had time to drink the milk in our fridge before it sours. Being that we pay $9 a gallon for raw milk, throwing it out is not an option, I had to find something to do with it. Besides using it in countless recipes which I just don’t have the time to experiment with at the moment, I found one suggestion to use it to make paneer cheese. I had never tried making this type of cheese, but figured I had nothing to lose but a little sour milk, about $4.50, and according to the recipe — 30 minutes of my time. Bring milk to a near boil, just below 200 degrees F.
Remove milk from heat and stir in lemon juice or vinegar. The milk should begin to curdle immediately. Cover milk and let sit for 10 minutes for curds to separate from whey. Strain the curds through a jelly bag or cheese cloth. Gather the edges of the cheesecloth or jelly bag and gently squeeze to remove excess whey. Open cheesecloth and sprinkle salt over curds. Stir. Wrap curds back in cheesecloth and put on large dinner plate. 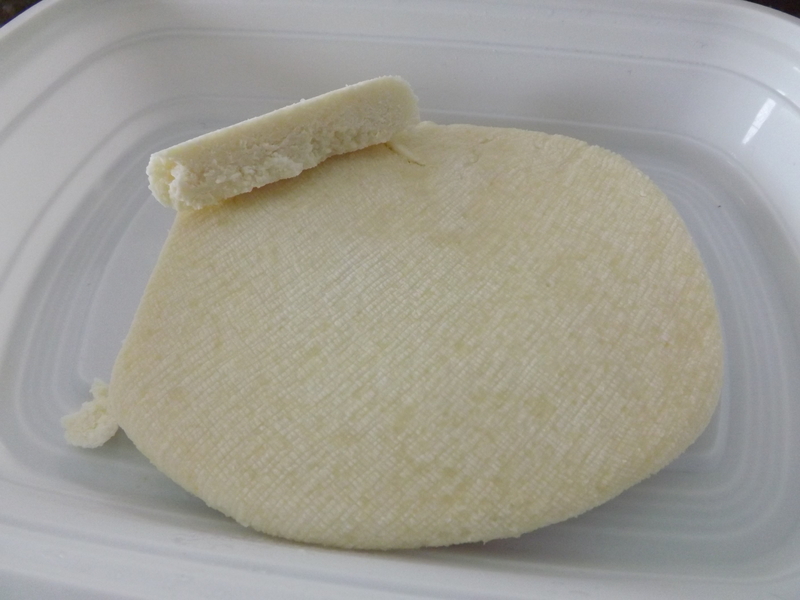 Shape cheesecloth into a square, pulling cheesecloth tightly around the curds to form. Set a second plate on top of the curds and weigh it down. Let sit for at least 15 minutes or up to an hour. Once pressed you can either eat it right away or refrigerate. If you eat it warm, the cheese will be crumbly. If you let it cool completely in the refrigerator, the paneer will be much firmer. Although this recipe claimed it should take only 30 minutes, being my first time, it took somewhat longer. I let it sit in the refrigerator for about 8 hours before Hubby got to taste it. To be honest, I am not a big cheese eater. Hubby, however, loves all sorts of exotic-type cheese and could not wait to get his hands on this one. He loved it. The only thing he said he would change would be to add more salt, which is exactly what he did. With salt shaker in hand, he took the block of cheese to the kitchen table and ate the entire thing. I guess that’s indicative of a successful recipe. I hate throwing money away, especially when it comes to food. With this new recipe I have a backup plan in place that will ensure not a bit of raw milk will go to waste in our house, and for this I am — Simply Grateful. I am always so amazed at your creativity! Thank you. I just wish I had more time lately to do more creative things. I actually thought of you yesterday when on the spur of the moment I made blueberry jam. I found them for .50 per basket and could not resist! ! What a great price! I love it when I can find produce at a super bargain. Blueberry jam is one of my favorites. Last summer/fall I made a batch with some lime and that was really good too. In fact, just this morning I opened a jar of my blueberry/lime jam for my English muffin. Oh yum. I used lemon juice and some lemon zest but might try the lime next time. This was my first attempt at blueberry jam. Turned out pretty good if I do say so myself! I how to score some apricots which is my favorite jam to make-and eat.